We can understand the meaning of the Queen of Cups from taking a closer look at the woman in image. She is seen as compassionate, caring, sensitive, and nurturing. She connects with people on the emotional level, so people enjoy her honesty and fairness. The appearance of the Queen of Cups in a reading can be guiding you to find help from others. Most times, like the other queens, this is a female figure that will come into your life. The Queen of Cups has an intuition which is very powerful, and is only rivaled by the one of the High Priestess. 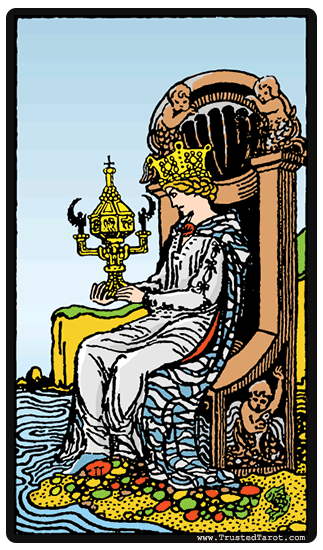 The Queen of Cups acts as a mirror and reflects the depths present in others, so they see themselves in a new light. Most times, the Queen of Cups can also represent the trusted inner voice you have within you. She seems to say that you should take the time to focus on your emotional health before trying to help others. Self-love creates compassion. The Queen of Cups can also represent the trusted inner voice you have within you. The Queen of Cups can also reflect your relationships with other people. You may be the emotionally strong rock that serves as an anchor for someone else. You may be here to help teach and support others using your intuition, instead of logic. The Queen of Cups normally thinks with her heart, instead of her mind. She can lack rationality and common sense, but she can also be intuitive, dreamy and almost psychic at times. The Queen of Cups could be the answer to your problems when a logical approach is not working. The Queen of Cups reversed means that you are not in sync with your emotions. You can also feel restricted in the expressing the way that you truly feel. Most times, bottling up your emotions can be very damaging and will lead to a boiling point in the near future. You may have high levels of stress that you are not able to cope with anymore. The Queen of Cups reversed can also reflect that your mind is wandering too far, and you are letting your imagination run away with itself. While you still mean well, you should take a pause to really see whether your emotions can be trusted, because you are allowing them to control you. You need to take some time to think if these dreams can be turned into reality. You should try to be more emotionally stable during these times, so you will know when your emotions are getting the best of you.